Experience a host of Iceland’s natural wonders, from waterfalls to glaciers to the Golden Circle, in one day on a private tour from Reykjavik. Hop into a sturdy 4x4 vehicle with a personal driver-guide, and explore the Golden Circle sights of Thingvellir National Park, Gullfoss, and Geysir. Go off-road to see the Langjökull glacier with the option of a snowmobile ride, and then head to Iceland’s south coast to see the mighty waterfalls of Seljalandsfoss and Skogafoss. Price is per vehicle, based on a maximum of six passengers. Leave your Reykjavik hotel by Super Jeep, a rugged 4x4 designed to cover challenging terrain, and set off on your private tour. Along the way, hear about Iceland’s history and geology from your professional guide, and gaze at the stunning lunar-like volcanic countryside. Enter Thingvellir National Park, a UNESCO World Heritage Site since 2004, and see Althing, the site of Iceland’s first parliament in 930 AD. Continue to the park’s continental rift, where the tectonic plates of Eurasia and North lie above ground, and take a walk between the two rocky ridges. Then, visit the Geysir geothermal area in Haukadular. 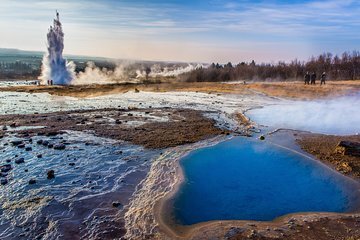 Stroll around the boiling pools and steam vents, and see the Strokkur geyser erupt, sending a flume of water into the air every five to 10 minutes. Continue to Gullfoss, considered the queen of Iceland’s waterfalls. Take in the fall and look for the rainbows that can appear above the two cascades as they plunge into a gorge. Drive off-road to see the Langjökull glacier, and choose to take an optional snowmobile ride (own expense). View the hothouses of Fridheimar to learn about Iceland’s greenhouse horticulture, and continue toward the Eyjafjallajokull volcano, famous for the 2010 eruption that disrupted European air traffic, to witness two of Iceland’s southern waterfalls. See the Seljalandsfoss fall, whose waters crash down 196-foot (60-meter) cliffs. Admire the cascade, and depending on road conditions, follow the footpath behind the curtain of water. Then, view Skogafoss, one of Iceland’s biggest falls. Measuring 82 feet (25 meters) wide and with a 196-foot (60-meter) drop, this thundering fall is breathtaking. If it’s sunny, watch for the double rainbows that can form in the clouds of water spray. Later, journey back to Reykjavik where a hotel drop-off rounds off your tour.